A new research project funded by the Arts and Humanities Research Council (AHRC) begins today. Colleagues in Typography, Architecture and Pharmacy at Reading, and in Human Factors at Loughborough, are working with a science communication agency, Design Science and the Day Lewis pharmacy chain to ‘improve the knowledge and understanding of Anti-Microbial Resistance (AMR)’. The project introduces the idea of ‘persuasive space’ which brings together the use of space in document design and the use of space in interiors (in this case community pharmacies) as mechanisms for engaging people with AMR. We look to the past for inspiration, using material from Typography’s world-leading Lettering, Printing and Graphic Design collections. 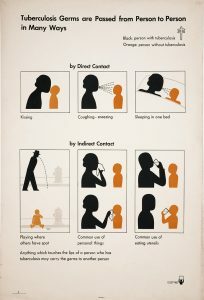 We have been inspired by Otto Neurath’s work using public spaces to engage people with information, including a series of charts about the prevention and treatment of TB for the National Tuberculosis Association in the USA in the 1930s. Nineteenth- and twentieth-century printed ephemera about microbes and hygiene will provide additional routes to understanding past approaches to public engagement with science. The project has ambitious outputs, including a competition where teams of architects, information designers and pharmacists will work on prototypes for the use of persuasive space in a community pharmacy. The winning solution will be installed in a Day Lewis pharmacy and we will elicit feedback from pharmacy workers and customers. We are also planning an exhibition to display archival material, along with the competition entries. 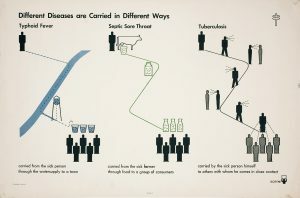 The charts illustrated above are from the ‘Fighting Tuberculosis’ exhibition produced for The National Tuberculosis Association in the USA in 1938. As well as the design of the charts, Otto Neurath and his team designed the space in which they were to be viewed, and provided guidance on how they should be set out. Each chart measures 920 x 610 mm. This entry was posted in From the archive, Research. Bookmark the permalink.